The Bead Project teaches women how to create over a flame, start a business, and focus their talents. Published on Thursday, November 16, 2017. This article appears in the October/November 2017 issue of American Craft Magazine. The beads for these bracelets were made by seven different classes of the Bead Project, a program of UrbanGlass. Like many artists, Ghislaine Sabiti, a painter and costume designer in Brooklyn, struggles to pay the bills. Because of the high cost of studio space and rent, Sabiti went into debt to pay for supplies to make and exhibit her work. Paying for workshops was out of the question, so when she heard about the Bead Project, a free 10-week program that teaches women glass beadmaking and business skills, she knew she wanted to apply. “It changed my life,” Sabiti says of the program, which she completed last spring. “I’m now incorporating beads into my paintings, with embroidery. It took my art up to the next level,” she says. The Bead Project is an outreach program of the Brooklyn nonprofit UrbanGlass, which has hosted world-renowned glass artists such as Dale Chihuly and Toots Zynsky since it opened in 1977. The program uses bead-making to empower creatively inclined, economically marginalized women such as Sabiti. Each year, 20 women learn both flameworking and small-business skills to help them make more money. They also receive torches, tools, and supplies at the end of the course. 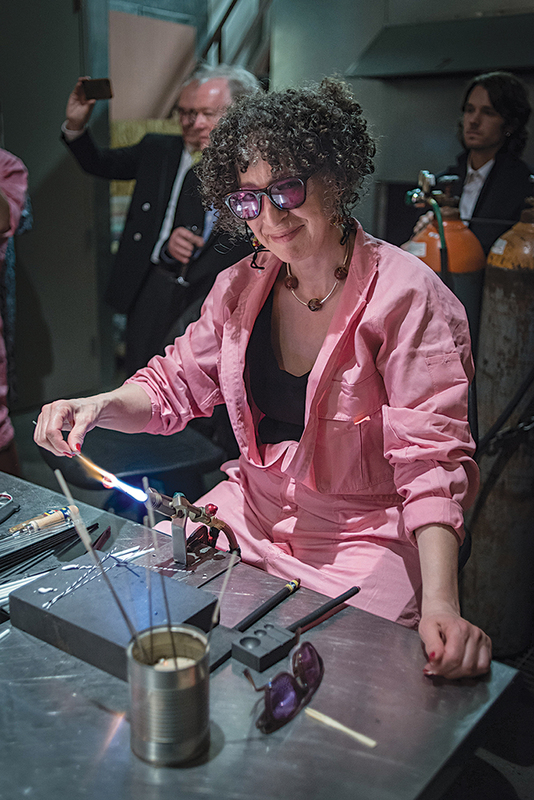 “The Bead Project allows women to explore glass as a mode of creative expression, and, ultimately, that diversifies the voices in glass, a material that very few people can afford to work in,” says artist Amy Lemaire, the program’s director and primary instructor. The program was founded in 1997 by Annette Rose-Shapiro, then managing editor and publisher of Glass Quarterly, UrbanGlass’ magazine. At the time, UrbanGlass didn’t offer scholarships; the Bead Project sought to make glass more accessible to New Yorkers from all walks of life, according to UrbanGlass executive director Cybele Maylone. Funded by donations and foundation grants, the program is promoted by the city’s social service agencies and elected officials. 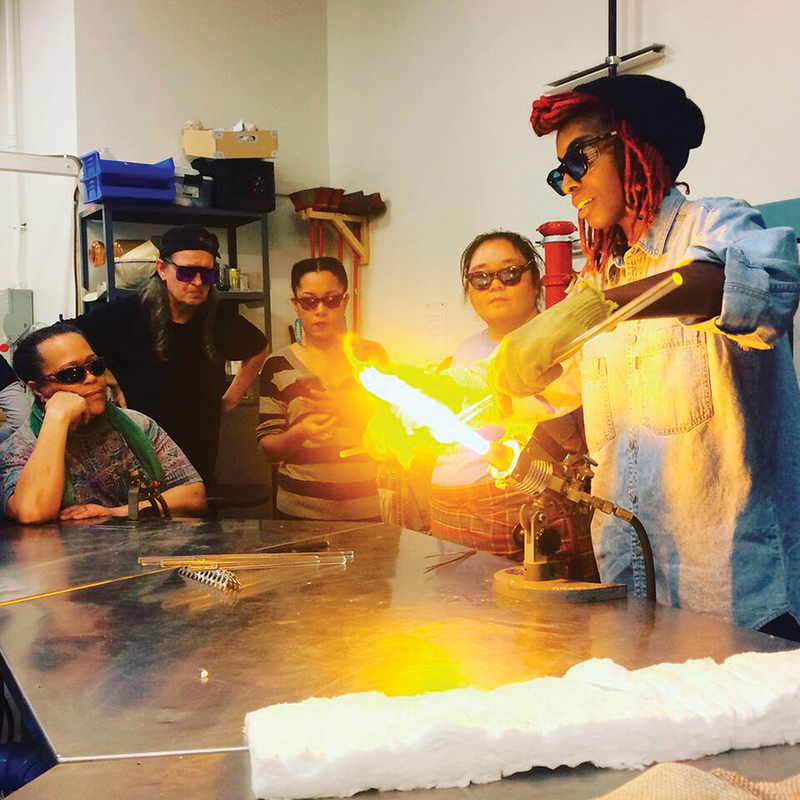 Ten women are selected each semester from a pool of applicants and spend four hours a week learning how to create beads by heating glass and forming it around a mandrel. Students spend an hour of each class creating a business plan that describes how to identify potential clients, price their work, and market it. “The confidence students develop in the classroom translates immediately to their work in the studio when they approach the flame,” Lemaire observes. While the course covers all the key techniques of beadmaking, Lemaire focuses on helping students flesh out their own ideas; one student, for example, wanted to make beads inspired by the irregular curves of coastlines. Besides their own work, students make 13 beads for their classmates; on the last day, they exchange them, so everyone ends up with a bracelet. “Looking at the beads in those bracelets, you see completely different voices,” Lemaire says. A major goal of the program is to provide a supportive environment for women dealing with difficulties. Some participants come from homeless shelters. Many of the students are artists, from recent college grads to retirees. The studio is fully accessible to participants with physical disabilities. “Everyone helps each other. There’s no competition; it’s all teamwork,” Sabiti says. In September, project alumnae came together for a luncheon and an exhibition of their work to celebrate the program’s 20th anniversary. Maria Aroche credits the program with dramatically changing her life. When she joined in 2007, she was a stay-at-home mother of two. As an undergraduate, she had studied jazz, but her artistic pursuits fell away as family life took over. She had been fascinated by glass since childhood, and the Bead Project, she says, “opened up so much possibility.” After completing the class, she began selling her creations on Etsy and started giving private beadmaking lessons. Now, she’s Lemaire’s teaching assistant. As an alumna, she can rent workspace at UrbanGlass for $20 a day. Kenya Chester demonstrates flameworking, the process used to make glass beads. 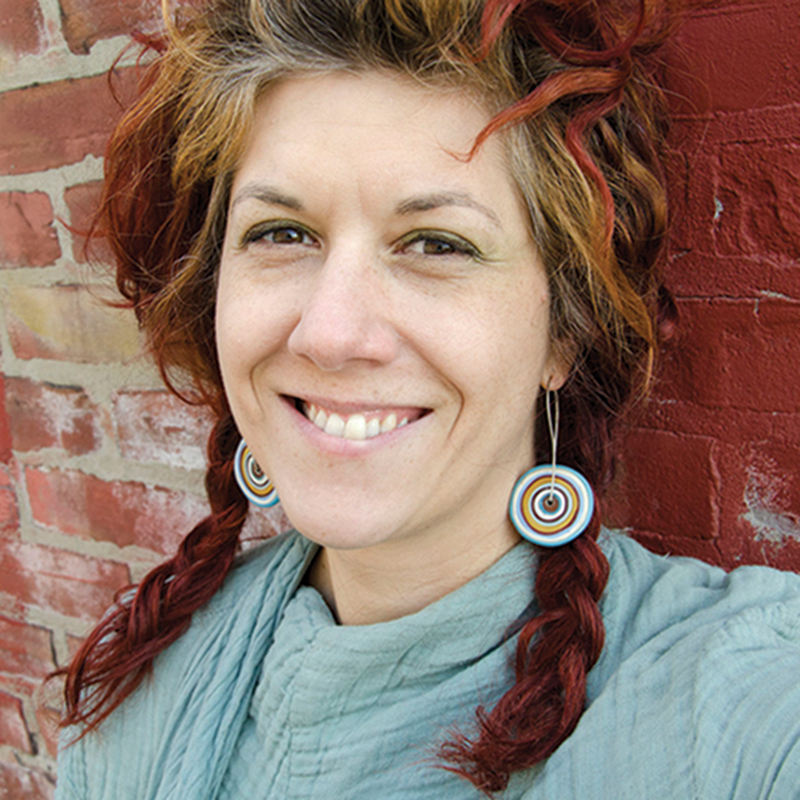 Bead Project director Amy Lemaire says the ultimate goal of the program is not just to teach technique but to develop creative confidence. 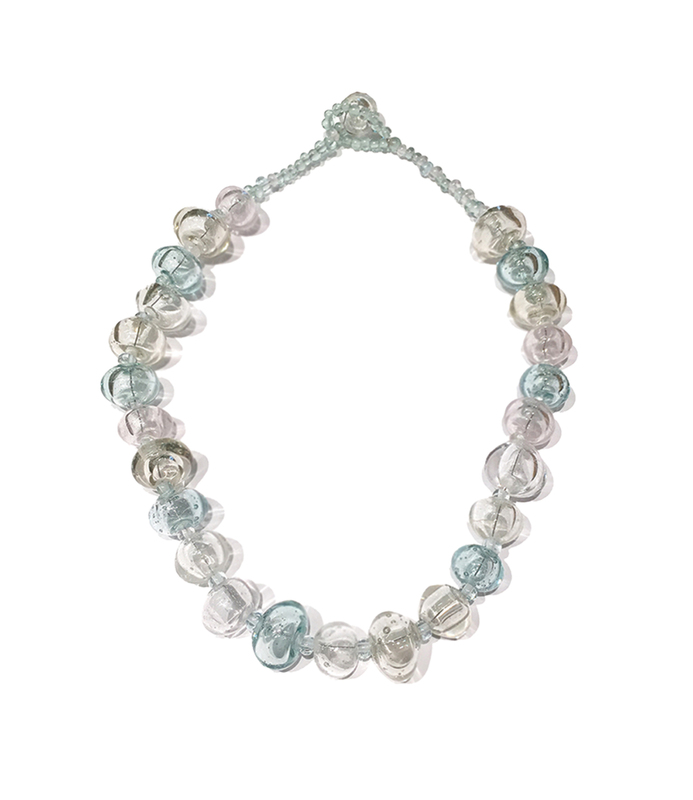 “It changed my life,” says Ghislaine Sabiti of the Bead Project. Here, she shows off the fruits of her labor at her graduation ceremony. A hollow-bead bracelet by 2014 graduate Kenya Chester. 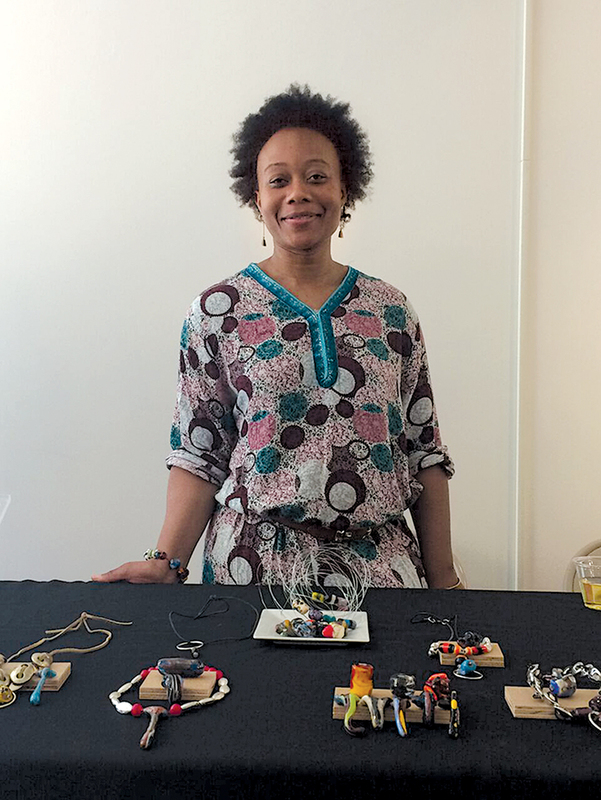 Maria Aroche, a 2007​ ​​​​​​Bead Project graduate, now works as a teaching assistant at UrbanGlass and makes her own glass jewelry.